India’s recent cross-border strike into Myanmar leaves many questions, but it’s no model for Pakistan-based terror. The cross-border operation itself is significant and signals that political willingness now exists in New Delhi to pursue those that target the state even beyond India’s territorial borders. Details of the actual operation, which some reports suggest was carried out by paramilitary and Army Special Forces, are limited. But by all available accounts, all aspects of the sensitive operation, from the diplomatic to the military were efficiently executed. India also benefited from assistance provided by the Myanmar government. The cross-border raid itself was facilitated by a 2010 India-Myanmar agreement on counter-terrorism. However, India’s media and some of its politicians reacted to the operation with predictable bombast. Parallels between the Myanmar operation and the United States’ Operation Geronimo (that resulted in the killing of Osama bin Laden) were drawn when almost none exist. One news media house claimed that the Indian Army “did a Rambo on Naga militants,” whatever that means. Over-enthusiastic news reporters described “hot pursuits” and “precision strikes” when neither term accurately represents the operation. Since no picture or video files of the operation were ever released by the Ministry of Defense, none of the images of helicopters or army men in uniform that inundated TV screens and news websites actually had anything to do with the operation. One popular prime-time TV anchor who, as a matter of routine, invites commentators from Pakistan and proceeds to yell at them for the duration of the show, hounded his Pakistani guests by demanding, “Why are you so nervous?” And finally, Col. (r) Rajyavardhan Singh Rathore, now a junior minister in the Ministry of Information and Broadcasting, issued a barely-concealed warning to Pakistan that India “would choose the time and place” of targeting terrorist groups harbored by that country. Not only is such rhetoric unnecessary and in poor taste, it is also counter-productive and could hurt India’s ability to enlist the cooperation of Myanmar or other friendly neighbors like Bangladesh, Bhutan, and Nepal in further counter-terrorism efforts. But beyond the bluster of the Interior Minister’s statement lies an element of truth.Pakistan isn’t Myanmar. It is a nuclear-armed state with the world’s sixth-largest armed forces. Moreover, while India’s cross-border operation was conducted with the cooperation and concurrence of a friendly Myanmar regime, the dynamics of its relationship with Pakistan might preclude such an operation from being conducted on its western border without the concurrence of Pakistan. So does this mean that India is without options when it comes to terrorism emanating from Pakistan? Not really. Public discourse in India appears to be quite unnecessarily tied down with notions of surgical strikes or Special Forces-led operations on terrorist training camps. In reality, the employment of surgical strikes, for example, represents one just one of many options, both overt and covert, at India’s disposal. Some of these capabilities are best left unstated. Ultimately, if the objective is to impose costs on an adversary in response to, let’s say, a terrorist attack on a major city, should it really matter as to how the state goes about prosecuting action? The choice of an appropriate course of action must be based on a determination of objectives, assessment of the suitability and feasibility of alternatives, and an evaluation of whether the consequences of India’s actions will be cost justified. India’s political and military leaders are entrusted with the defense of India and its interests and it is best left to them to decide on the appropriate courses of action should they be necessary. Repetitive clamor for surgical strikes when more attractive alternatives might present themselves is silly. The 11/26 attacks in Mumbai were a seminal event in that after years of ambivalence, the United States and international community were finally sympathetic to India’s views on terrorism originating from Pakistan. In the past, the Pakistanis have attempted to rely on the U.S. to use its political clout in New Delhi to ward off an Indian response to Pakistan’s transgressions. But the United States’ willingness to do so ended with 11/26. Indeed, former U.S. National Security Advisor Gen. James Jones warned Pakistan that the U.S. was not going to be able to hold India back in the event that there was another terrorist attack in India traced to Pakistan. The public mood in India too has changed decisively in favor of punitive action against terrorism. India’s political class and national security managers, quite rightly, feel the need to respond to such sentiment. In the context of this hardening of public sentiment and the ruling National Democratic Alliance’s electoral promises to take a tough line on terrorism, the cross-border operation in Myanmar serves as a signal of intent from the Indian government. Other countries, of course, are free to ignore or draw whatever conclusions they wish to from the operation. So yes, Pakistan is not Myanmar. 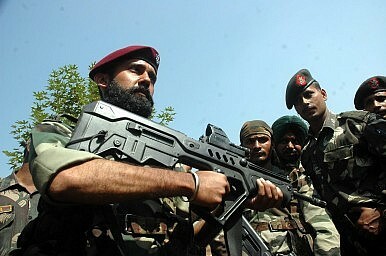 A Special Forces-led operation deep into Pakistan to take out terrorist targets may not be feasible. But it may also not be necessary. What does India's recent use of force in Myanmar tell us about its power status?